> root of 3 1/8 x 256/81 = 800/81. Jacob , well im sure your right in that the ancient Egyptians used those body part units of measure for their every day utilitarian uses , and that Seked run rise malarky . But when it comes to constructing the most elaborate build of their time , to which i claim was designed by intelligences far in advance of those Seked users , then yes you are right the indigenous people of those times did not use Pi . 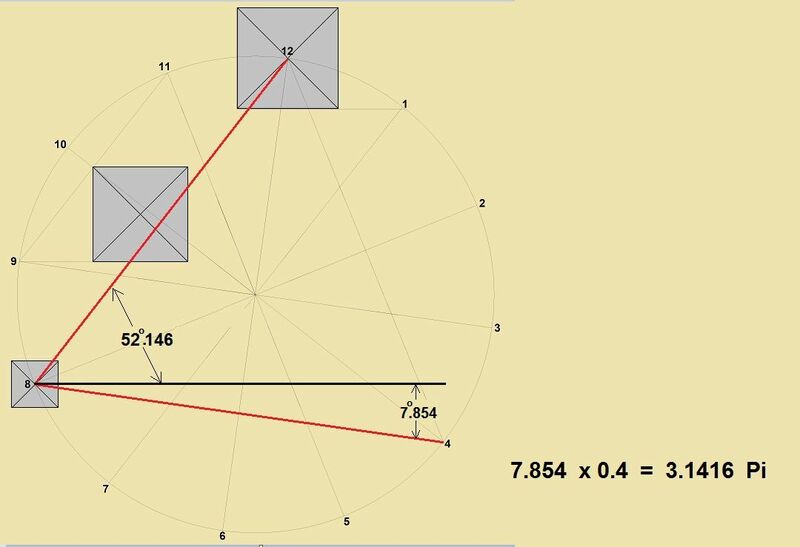 So who then designed Giza, the spacing between G1 and G3 is set at an angle of 52.146 degrees, thereby if an equilateral triangle is formed using this ratio then the horizontal offset is 7.854 degrees and x 0.4 we get 3.1416 . Not only have they encoded Pi in those spacings, but now take the East side of G1 at 9069", construct another equilateral triangle based on its half base of 4534.5" and its height will be 3927" x 8 and that = 31416 again we have Pi. So Jacob, you are right, and so am I , and others who find Pi at Giza. Edited 1 time(s). Last edit at 07-Dec-18 14:10 by DUNE.